The Man Who Invented Christmas may as well be one of those holiday Hallmark originals for all of the dopey, saccharine spins it puts on Charles Dickens coming up with "A Christmas Carol" and the overall quality of life in 1843, but luckily director Bharat Nalluri (Miss Pettigrew Lives For a Day) was working from a screenplay by writer/actor Susan Coyne (Mozart in the Jungle) as adapted from Les Standiford’s 2008 novel of the same name where distinctive features of those Hallmark originals (or hallmarks of those hallmarks) come to be non-existent. There is no gushing love story at the center of it, no excessive amount of perfectly pressed pants or flannel (or whatever the equivalent was in 19th century London), but rather there is this overriding feeling that came to pass throughout the entirety of the experience that was one of lovable cheese. The usual suspects of certain clichés and plot points might not all be present, but that feeling of the overwhelming power of pure holiday love and all that it can conquer, is. And while this may just be due to the fact I’m a sucker for the Hallmark channels block of holiday programming to the point I draw every holiday-themed movie back to these standards The Man Who Invented Christmas is so family friendly and earnest in its intent that it’s hard to discern between what the movie wants you to feel and what this material should make you feel. As another in a line of “story behind the story” films that have, for one reason or another, decided to catch on some thirteen years after Finding Neverland made it a hot idea to studio execs The Man Who Invented Christmas is perfectly serviceable in delivering all of the broad moments required by an audience that craves what they already know; the name Marley coming from a waiter at a restaurant where Dickens was eating for instance coupled with the tidbit that he “collected names” for his works from his everyday life. Things one could have just as easily assumed without having concrete proof of them, but this is the kind of depth and insight The Man Who Invented Christmas offers: facts that might not have been necessarily well-known, but ones that are rather obvious in that they aren’t surprising and offer little to no real drama that would justify this story about Dickens writing his career-defining novel being a story in its own right. Mr. and Mrs. Dickens (Jonathan Pryce and Ger Ryan) surprise their son, Charles (Dan Stevens), and his wife, Kate (Morfydd Clark), with a holiday visit. At the onset of our story it is 1843 and Charles Dickens (Dan Stevens) is three books past the success of "Oliver Twist" and has yet to yield another hit with each of his last three works amounting to little more than simultaneous critical and commercial flops. It is at this juncture that Dickens and his friend as well as seeming agent Mr. Forster (Justin Edwards) decide to part ways with the publishing houses they have relied on to garner Mr. Dickens the prominence that he is presently enjoying and instead self-publish Dickens latest work when it becomes apparent those who were once happy to profit from Dickens name and talents no longer believe in his vision. The problem with this is that, when The Man Who Invented Christmas begins, Dickens doesn't have much of a vision for himself much less his latest book. Dickens, who is married to wife Kate (Morfydd Clark) and has four or five of his eventual ten children in 1843, has encountered writer's block, but along with Forster sets himself a deadline for which to deliver his next work that he ultimately gains inspiration from via his family's new house maid, Tara (Anna Murphy), who he overhears telling the children a bedtime story dealing in spirits and their returning from the dead. Needless to say, with multiple children, many more on the way, and the expense of such excesses as multiple maids and cooks not to mention the renovations taking place at his home, Dickens feels a bit in over his head with the bills beginning to pile up. Determined to recover and make it through with all facets of his life still intact, Dickens decides to write a Christmas story and self-publish it in less than two months. As Dickens labors writing on such short notice, his estranged father (Jonathan Pryce) and mother (Ger Ryan) come to bunk with him bringing about painful memories of his father and the negative effects the man's presence had on his childhood-largely focusing on the senior Dickens lack of financial responsibly, that often left young Charles curious as where his next meal might come from. The aforementioned case of writer's block and the arrival of his father essentially forces Dickens to confront his personal demons which, once such context is provided, this film essentially does through displaying Dickens creative process as he imagines his characters, names them, converses with them to find their voice, and so on and so forth. Here we're privy mainly to his creation of Ebenezer Scrooge (a delightful Christopher Plummer) whom Dickens struggles for inspiration against in this account of how challenging creating something truly memorable is, but how rewarding it can be as well-especially when it comes to define the essential soul of modern Christmas. With as much taken into consideration The Man Who Invented Christmas is also a brisk hour and forty-five minutes that accounts for every single moment in Dickens life at this time that would come to influence the writing of "A Christmas Carol" and not much else, leaving audiences no choice but to think that every little occurrence in every aspect of Dickens life no doubt ultimately made its way in some capacity into his writing. There are connections at every turn, which gives the misleading impression that it is easier to coerce such details into a cohesive story when you decide to utilize everything that is thrown at you when the real skill is deciphering what's inspiring, what's worth keeping, and what is not. That The Man Who Invented Christmas reduces every moment to being a key one is the major disservice it does to aspiring writers who will look to the film hoping to catch some glimpse of what might have been one of the great's approach to the craft, but if you're an aspiring writer you should also know not to get your history from the movies and so, as with everything, it's all about balance, folks. And while Nalluri's film may be anything but well-rounded with its excessively sweet and sentimental core flourishing over every one of the more dramatic beats the film dares to hit it’s not difficult to see all is meant well and done with a kind of ambition that is necessary to even get a film such as this off the ground in the current cinematic landscape. Sure, the film knows nothing of the meaning of being understated, but when we get scenes where Dickens goes to his publishers to have a discussion about his latest idea and what they are willing to pay for it and pitch how they might publish and promote it while then simultaneously citing the inspirations for Scrooge’s view towards Christmas there is a sense of pleasure in the obvious-a communal feeling that is inspired by the fact we all understand what is being inspired and, while obvious, is still fun to behold even if it isn't wholly factual; the essence of what might have happened feels justified, at least. 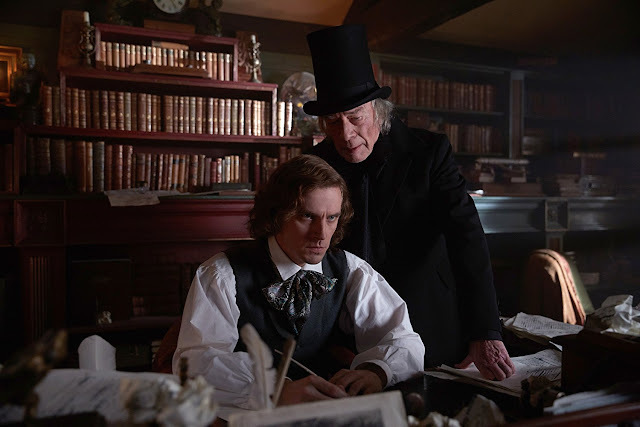 There are other moments though, sequences really, where Stevens’ Dickens locks himself in his study and works through character creations, allowing Plummer to really flourish in this unique opportunity to play Scrooge as an amalgam of ideas rather that the caricature he has become so many years later, that are more informative in respect to Dickens writing process than those obvious sources of inspiration the film trots out to display. 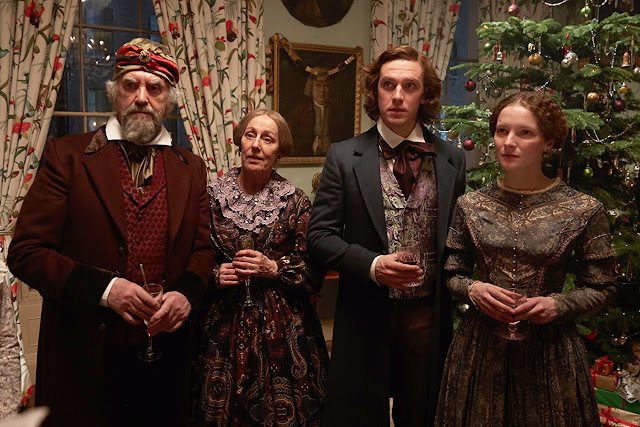 It is in these moments where The Man Who Invented Christmas genuinely hypothesizes over what it must have been like to step inside Dickens’ mind, something no one can be sure of, but that the film is at least is ambitious enough to formulate an opinion on that it succeeds the most. 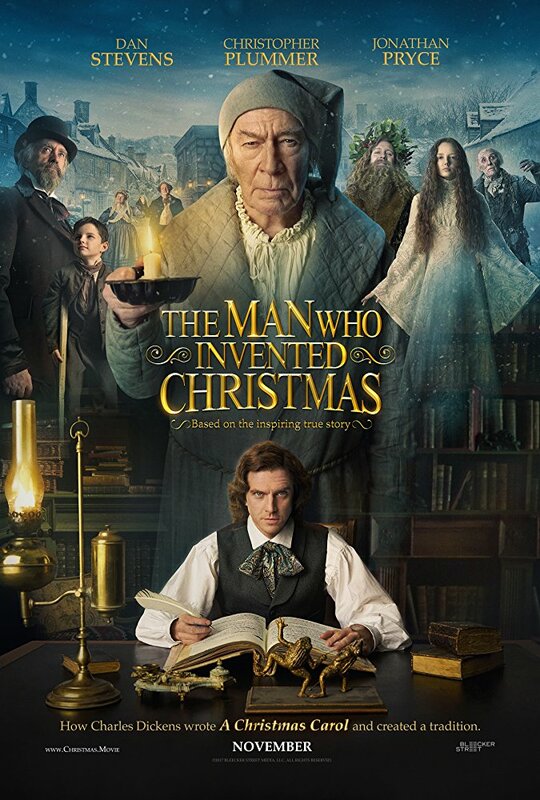 Charles Dickens is haunted by the character of Scrooge (Chrsitopher Plummer) as a creation he can imagine, but hasn't fully realized in The Man Who Invented Christmas. Everything else here is somewhat muddled in the confines of how the film presents the many sides of Dickens' life and all he was dealing with at this moment in time when we meet him. At any given moment outside Dickens' office it's difficult to get a grasp on the frame of mind of our protagonist. As it is, The Man Who Invented Christmas prefaces the audience with a few cards of text prior to the film beginning and then drops us into his writers block and personal life where we're meant to piece together the strands of current life events in order to understand both the character and the source of inspiration for the novel (or novella) in question. As mentioned, those scenes where we see Dickens holed up in his home office working through his creative process are some of the best, but unfortunately they are too few and far between to really carry the whole of the picture. Instead, we lie witness to Dickens having issues thrown at him from every direction outside of his safe place to the point it's understandable why he can't concentrate on a single idea as well as why he can't seem but to want to escape there day after day. Hell, maybe this is the intent of the script in order to emphasize Dickens' need to write both for a creative outlet and financial reasons, but it feels as if these elements should be secondary to those of the author actually working through and coming up with the ideas that would create the Christmas classic this movie is about the creation of. This is no fault of Stevens or the rest of the underserved cast though, as Stevens once again proves why he is one of the more interesting talents working in Hollywood today. Three years ago when writing about The Guest I would have never imagined the same actor playing the killing machine in that movie would, in as much time, be playing Charles Dickens in a movie where he purposefully camps it up in the hopes of capturing the coziness of Christmas in a single facial expression. The rest of the cast is fine if not necessarily notable (it's a shame Pryce is given little to nothing to do) whereas most of the narrative outside Dickens himself is more by the numbers than that of the internal conflicts we're witness to that tend to actually present themes and ideas to ponder past the inevitable which is the fact "A Christmas Carol" gets finished in time and is a massive success. Those previously mentioned daddy issues and painful childhood memories that the author was still working through by the time he reached this, his ninth publication are hit over and over again when once would have more than sufficed. These kinds of obvious markers deliver the movie audiences no doubt expected to receive and are likely more than fine with, but The Man Who Invented Christmas is far more enthralling when it dares to step outside these markers and inside the depths of Dickens brain that reveals why his storytelling tends to still resonate today.